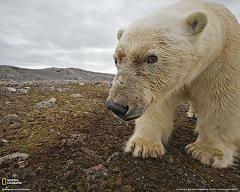 Polar bears will eat about anything that moves, as well as a lot of things that don’t. They probably would eat penguins if given a chance, but because the two are on opposite ends of the earth, it just won’t happen. Polar bears and penguins are literally poles apart. Polar bears live in the Arctic near the North Pole, while penguins live in the Antarctic near the South. As a result, polar bears mostly eat seals. Seals, as you may know already, eat penguins. But again, given the geographic distance, the seals in question are completely different species, so penguins and polar bears aren’t even connected by a food chain. Specifically, polar bears especially love the ringed seal. One of their tricks is to hang around ice holes waiting for the seals to come up for air, and then render them unconscious by bopping them across the noggin. Polar bears also like charging the seals’ nesting grounds and eating their poor blubbery little babies. Meanwhile down south, it’s hungry leopard seals that eat penguins. They like to swim below thin spots of ice at penguin rookeries watching the black-and-white blotches through the ice above, ready to burst through and grab a bird. Leopard seals can completely consume a penguin in five to ten minutes, or roughly the time it takes to watch an old episode of Tennessee Tuxedo. Sea lions and killer whales also like to eat those cute little waddlers. Oh, sometimes nature can be so cruel. Penguins taste just like arctic terns.